S3D rendered and WebControl always shows full Printer height ? Hello to everyone, back again with some issues !!! 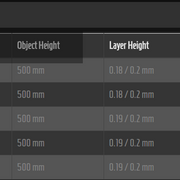 I render an object to gcode and upload it via API or Browser, I always get the full object height and full layer count. For my machine it is always 500mm and 2500 layers. This is kind of annoying since the time estimated is always funny. Now I need to know where I can find the names of variables, which webcontrol, respectivly duet3d is interpreting to get the right information displayed. It belongs to the Slicer. I did but I do not have a clue what a macro can do in respect of false information of a slicer? I can correct / override it if I get the names of variables I need to set, resp. what needs to be set in gcode file. Okay, i know what you mean and i've done the same. At the End of my Print, i've setup'd Simplify3D to completely lower my Bed down to Maximum (365mm). Therefore Simplify3D delivers this Value into the gcode and the Firmware reads the maximum in the gcode and calculates the Layer-Hight to this. 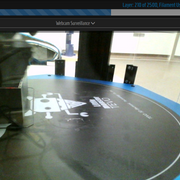 It assumes always that the Print is 365mm (in my configuration). I've deleted everything and put it into a Macro in /sys and call this Macro. The same is done and interpreted but Simplify3D cannot deliver it into the gcode. Therefore everything works as before but the Layerhight is calculated or interpreted correct! Hi, can you give me an example of what you talk about… sounds pretty abstract to me. You can get round this by putting a comment starting with ;E or ; E at the end of the G1 Z command line that moves the bed down at the end of the print. Thanks David, that wasn't known by me and i assume a lot of others!